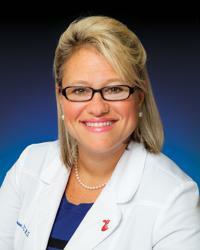 Dr. Jennifer R Brown is board certified in cardiology and advanced heart failure and transplant cardiology. She specializes in congestive heart failure, cardio-oncology, pulmonary arterial hypertension, women’s heart health and preventive cardiology. Dr. Brown’s main focus is helping patients improve their quality of life. For patients with heart failure, this primarily means improving symptoms and staying out of the hospital. Her office hours allow for frequent office visits as well as urgent visits if needed. She also works closely with local oncology groups to provide the best preventive cardiac care for patients receiving chemotherapy and radiation that can be toxic to the heart. Dr. Brown has a particular interest in pulmonary hypertension and optimizing the care of this very special population. Lastly, she spends time counseling every patient on the importance of a heart-healthy diet and healthy lifestyle, as she truly believes that nutrition is the best medicine. She will help you reduce your cardiac risk factors with dietary changes that will hopefully allow less rather than more medication. Dr. Brown works intimately with each patient and family to determine the right treatment plan, knowing that every patient has a unique story.